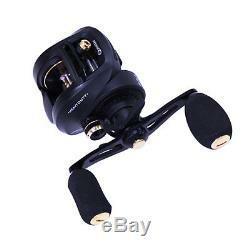 Zebco / Quantum Smoke Heavy Reel 7 Bearing, 5.3:1 Ratio, Baitcast, Right Hand M. Please read the item description for details. Zebco / Quantum Smoke Heavy Reel 7 Bearing, 5.3:1 Ratio, Baitcast, Right Hand Md: SHD200PPT, BX2 Whether you take Smoke HD in search of bass or bull redfish, a 7 bearing system anchored by 2 PT Speed Bearings promises smooth operation, and a noticeably oversized 95mm handle with large, comfortable EVA padded handle knobs lend a confident feel worthy of Greg Hackney calling Smoke HD the best reel he s ever fished with. Features: - Aluminum Spool - Strong aluminum frame and gear side cover - CSC drag system - Zero Friction pinion - Large EVA handle knobs - Continuous Anti-Reverse clutch - ACS cast control - Right Hand Retrieve - 7 Bearings (6 + Clutch) - PT Custom bearings Specifications: - Technique: Baitcast - Reel Handle Position: Right - Gear Ratio: 5.3:1 - Retrieve Rate: 22 - Bearing Count: 7 - Braid Capacity (Yards/lbs): 230/30 - Mono Capacity (Yards/lbs): 180/12 - Max Drag: 19 lbs. Anti Reverse: Continuous - Weight: 6.9 oz. This can be extended for special circumstances. Copy of invoice enclosed with merchandise. Enclose a brief letter of explanation for the reason of item return. AIR PISTOLS, AIR RIFLES AND ANY OTHER TYPE OF AIR GUN. SCOPES, if they have been mounted. Other optics if the SEAL has been BROKEN. Items manufactured by CAS Hanwei. SAFETY GEAR including harnesses, helmets, and ropes. Tree stands of any kind. If the merchandise you receive is defective, please call our customer service department for instructions. Items will only be accepted for return if the item and its packaging are in new, unopened and unused condition. This includes blister packs and shrink wrapping that an item may come needs to be uncut and / or unaltered. Note: Certain manufactures, like Leupold, will not allow us to take items back that the blister pack and or shrink wrapping have been opened. We do not accept international payments. If a dispute arises between you and us , our goal is to provide you with a neutral and cost effective means of resolving the dispute quickly. We will consider reasonable requests to resolve the dispute through alternative dispute resolution procedures, such as mediation or arbitration, as alternatives to litigation. Choice of Law and Forum. This Agreement shall be treated as though it were executed and performed in Elmore County Alabama and shall be governed in all respects by the laws of the State of Alabama without regard to conflict of law provisions. You agree that any claim or dispute you may have against us must be resolved by a court located in Elmore County Alabama, except as otherwise agreed by the parties. You agree to submit to the personal jurisdiction of the courts located within Elmore County Alabama for the purpose of litigating all such claims or disputes. All claims you bring against us must be resolved in accordance with this Dispute Resolution Section. All claims filed or brought contrary to this Dispute Resolution Section shall be considered improperly filed. The item "Zebco / Quantum Smoke Heavy Reel 7 Bearing, 5.31 Ratio, Baitcast, Right Hand M" is in sale since Wednesday, May 30, 2018. This item is in the category "Sporting Goods\Fishing\Reels\Spincasting Reels".